If you need a bondsman in Fort Pierce, you need an agent who works fast. Our agents understand the importance of getting yourself or your loved one out of jail and back home quickly. It’s crucial to call an experienced agent in the hours after an arrest, as you need a professional working on your behalf for the fastest bailout possible. When you choose our agency, you will have committed and compassionate agents working tirelessly for the release of your loved one from jail. When a person is arrested, they can avoid sitting in jail until their criminal case because of a unique and beneficial system called “bail.” Bail allows the court system to treat a person as innocent until proven guilty, by allowing the defendant (or a friend or family member) to pay a certain dollar amount to the court. This money acts as a sort of insurance, ensuring that the defendant will return to face justice and complete their criminal case. If bail didn’t exist, people would lose their jobs and experience other negative effects to their life because they would be stuck sitting in jail. Often, bail can be expensive (depending on the crime), and it can be difficult to pay because it must be paid to the court in cash, and in full. This is where working with an agency to obtain a bond is extremely helpful. With bail bonds in Ft Pierce FL, you only have to pay a small percentage of the full bail amount to the agent as a fee. They post a bond, and your loved one is released quickly. The entire bail process, from arrest to bonding out, can be confusing if you’ve never dealt with it before. Here’s an overview of what will take place after your loved one is arrested, and how you can help them most by obtaining St Lucie County bail bonds for their release. A person can be arrested anywhere, and at any time. Often, arrests take place after a detective or police officers has gathered enough evidence to obtain an arrest warrant. Following the arrest, the defendant will be taken to the nearest jail to be booked. Booking includes the taking of mug shots, fingerprinting, a background check, and a nationwide warrant search. Additionally, they will be searched for contraband, and their belongings will be confiscated and held by the jail. The length of this process can take from 4-8 hours, depending on the jail. Once the defendant has been booked into the jail, a bail amount will be set that must be paid in order for them to be released. The amount depends on a couple factors, including the severity of the crime that was allegedly committed, and the defendant's criminal background. Sometimes, bail is set automatically, but often it must be set by a judge (which often delays the process). Once bail has been set, it is wise to speak with a bondsman in Fort Pierce to get the bonding process started o the defendant can be released as quickly as possible and get back home. At some point in the booking process, the defendant will be able to make a phone call to a loved one, lawyer, or bail agent. However, these calls can only be made collect (which means they cost money). There is a way to create a fund for the defendant, but it is often unreliable. We recommend working directly with our agency, which is setup with the jail to receive collect calls. We'll be able to speak with your loved one and work quickly through the bonding process to get them released. When you obtain bail bonds in Ft Pierce FL for a loved one in jail, you will need to be a co-signer, or Indemnitor. When you sign the bond, you are taking on financial responsibility for the bond. This means that if the defendant skips bail (misses a court date), then you may be held financially responsible to pay for the entire bail amount. If you have questions about what obtaining a bond entails, call us 24/7 and we'll walk you through the process and determine the best option for you and your loved one. 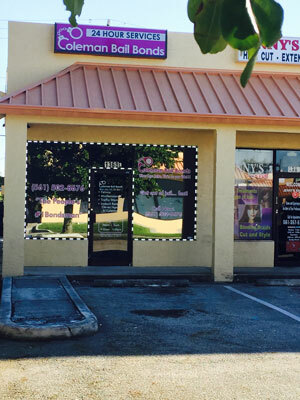 We are a bail bonding agency providing St Lucie County bail bonds, as well as bond across the state of Florida. Our state-licensed agents are professional, courteous, and knowledgeable. Most importantly, we fight tirelessly to get our clients released and back home quickly. We are available 24/7 to answer any questions you have about the bail process, and pride ourselves on getting people released from custody faster than any other agency in the area. Get them back Home quickly! We provide 24 hour service because we know that you need help IMMEDIATELY after an arrest. We provide bail bonds in Fort Pierce and across Florida. Don’t let your friend or family member sit in jail any longer than necessary. Call us with any questions!